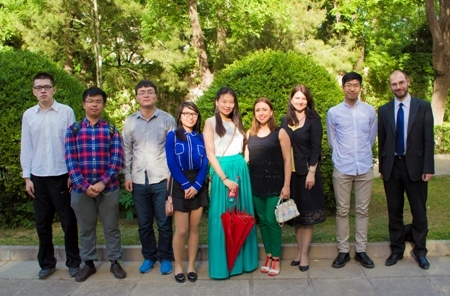 (Beijing, May 28, 2014) At the invitation of the Embassy of the Republic of Serbia in Beijing, professors and students of the Department for Serbian Language of the Beijing Foreign Studies University (BFSU) visited the Embassy on 27 May 2014. Charge d’ Affaires a.i. of the Embassy T. Panajotović Cvetkovic welcomed the guests from the BFSU, after which the students watched the Serbian movie "Ginger – More than a Game". Before the screening, the gathered honored the victims of the floods in Serbia with a minute of silence.